If you’re into Attack on Titan and spending lots of money, these statues might be for you. But you’ll need more than deep pockets to buy one. In Japan, 7-Eleven is offering limited edition statues of Attack on Titan’s Levi Ackerman and Eren Yeager. They’re large! 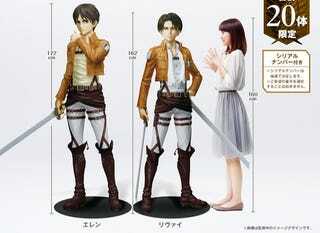 The Eren statue measures 172 cm (5.64 feet), while the Levi one is 162 cm (5.3 feet). Each is priced at 1,728,000 yen (US$14,438), and 7-Eleven is only offering twenty (ten Levis and ten Erens) statues, all individually numbered. But, as with 7-Eleven’s Neon Genesis Evangelion statues, you cannot stroll into any old 7-Eleven in Japan and walk out with one of these. First, you must apply and enter a lottery to win the chance to purchase one. (That’s right, win a chance to spend $14,000.) Applications start on May 22, and the statue will be delivered later this year after winners are notified. Sorry, international Attack on Titan fans with lots of money! This offer is for residents of Japan only.